This is a novel split into six: six sections, six protagonists, six time periods, six genres. 19th century New Zealand among tribes who are being colonised; pre-World War 2 Belgium; California in the midst of the 70s counter-culture; North-East provincial England; a dystopic Korea in the 22nd century (I think) where capitalism has been taken to alarming extremes; back to tribalism in a far flung future. The stories stop in their middle, only to start again after you have seen how the future has been influenced by these tales: in some cases this was significantly, in others not. Mitchell slips in and out of different characters and situations with astonishing ease, and what should feel—due to its scattered narratives and sheet ambition—cluttered, confusing and unfocused is held together by very wonderful but careful writing, and themes which emphasize humanity’s interconnected nature. Symbols, plot-points and characters occasionally connect the six stories, but these threads are never overemphasized to make a narrative point or to seem clever. In other words, they stay fun to spot. Each story shows someone trying to overcome oppression, but you could read each of them in isolation and still enjoy them. At its core, Cloud Atlas is occupied with humanity’s history of violence and opression, and where that history may lead us. That’s why it stays interesting despite being so ridiculously busy in terms of story. In each of the sections, arrogance, entitlement and greed mean that characters are unfairly treated and hurt. I expected something optimistic here, as I had watched the Wachowski’s film version, which changes some of the endings (most notably the tribal future’s) so they’re more uplifting. I think the novel is more honest about where our current course could take us if we aren’t very, very careful, and as such is a more honest plea for empathy. Many novels this ambitious falter because, in the search of grand philosophical themes and strange structures, they forget character and storytelling. 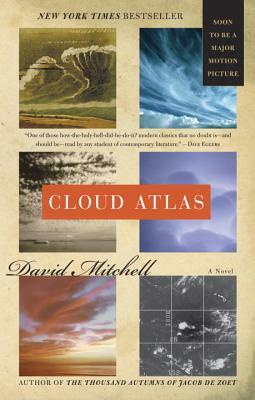 Cloud Atlas, thanks in part to its beautifully crafted first-person style (except in California, where it becomes an intruiging third-person thriller) feels extremely personal, and so succeeds where most other books of this sort would fail.